Happy Wednesday everyone and well done for reaching the middle point of the week, not long and the weekend will be calling us to play! 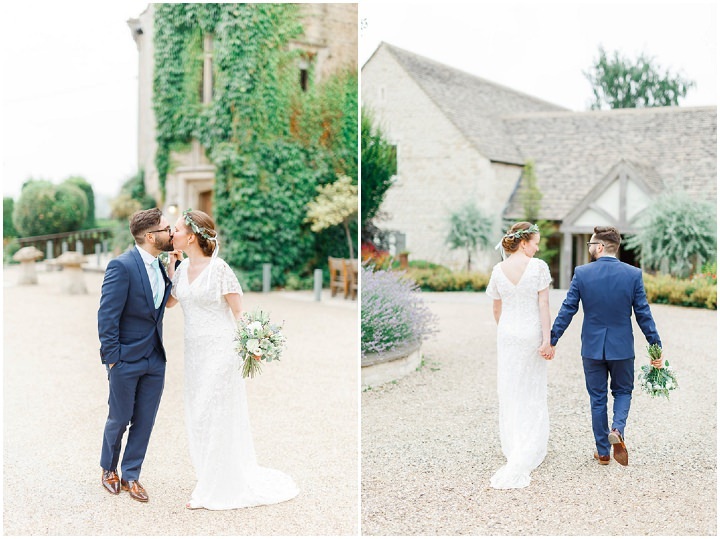 Today I am taking you to Stow-on-the-Wold for this beautiful barn wedding in the Cotswolds. 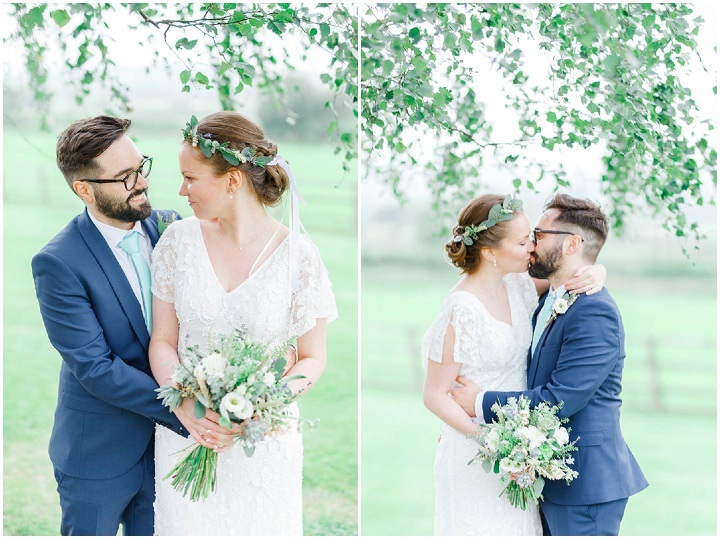 Emma and João chose a green and botanical theme for their day and it looks gorgeous against the white walls of Hyde Barn. 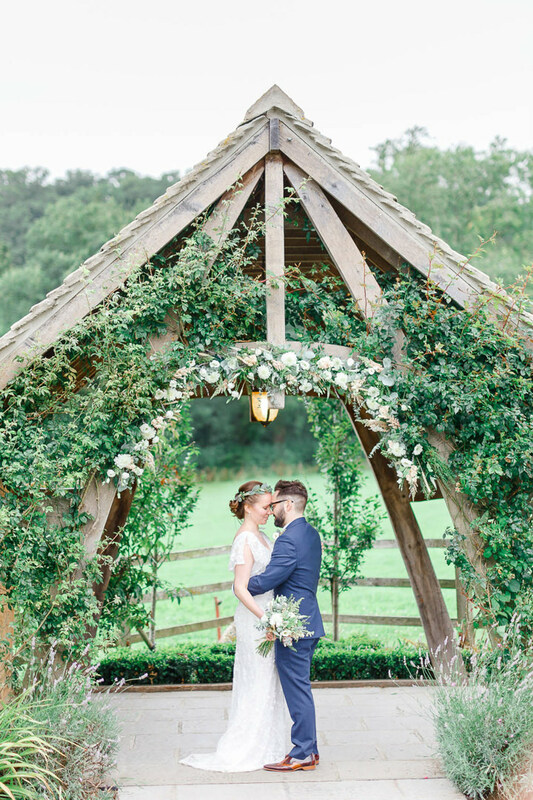 Hanging plants, succulents, and plenty of foliage and flowers all put together to create this beautifully dressed ceremony area and reception. 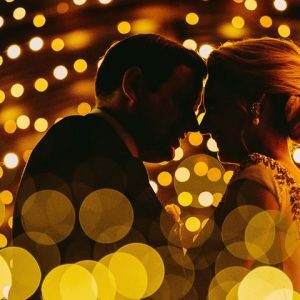 With a hint of the movies for their sub theme, this wedding is classic and fun and filled with the most amazing bright, light photography from White Stag Photography. 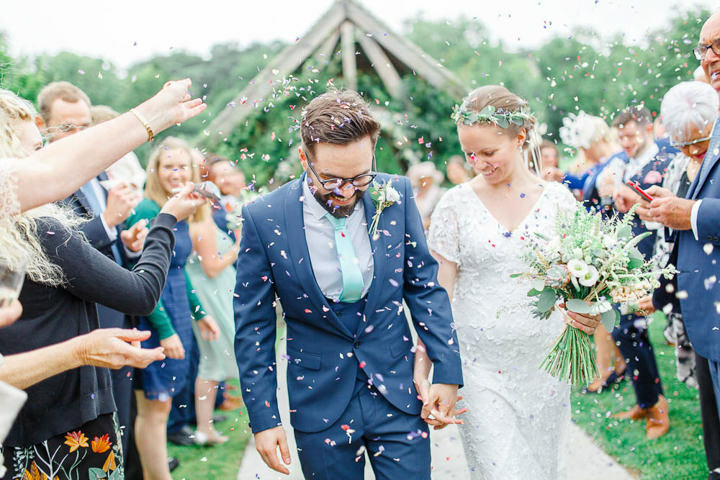 A green botanical-themed, relaxed English countryside wedding, with touches of Portugal. 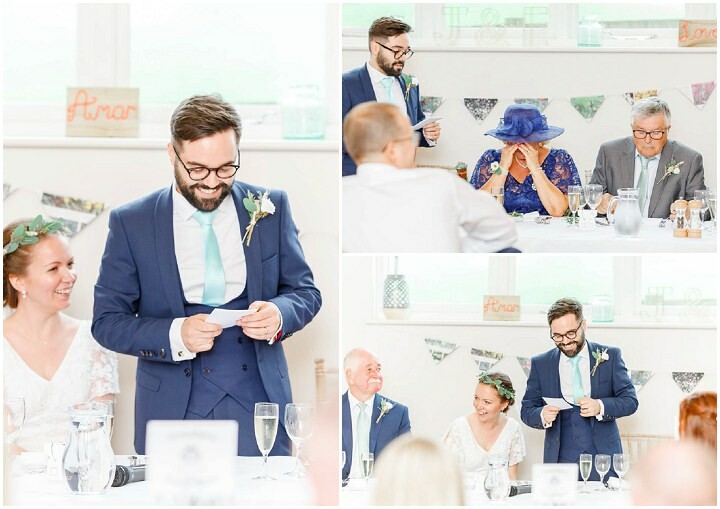 Small details that were personal to us made our day feel special and filled with lots of laughter and emotion! We are both now intensive care nurses in different hospitals, but we met back in 2009 when we worked together, both in our very first jobs on a medical ward. We were work friends for around a year before we started dating in February 2010. 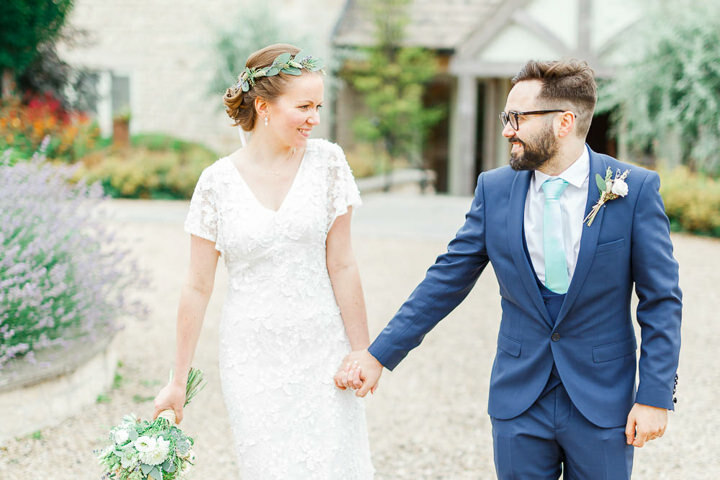 To be completely honest, neither of us really kept a specific track of the finances when it came to the planning. 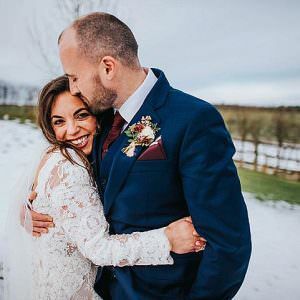 We knew what the food and drink was going to cost, based on our numbers, and we had a plan of how much we would like to spend on the honeymoon, and after that we pretty much did the rest as we went along! Luckily we managed to make some savings here and there and we are able to work extra shifts whenever we need to, We are also incredibly grateful for the generous donations made by both our families towards the cost. 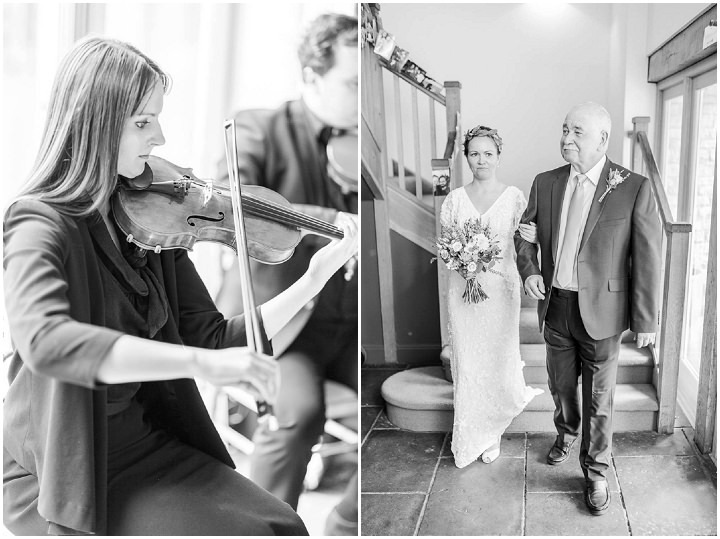 We were very lucky in having wonderful help from our family for a lot of aspects of the wedding, with Emma’s mum creating the wedding cake, and her sister doing all the make-up for the bride and bridesmaids. 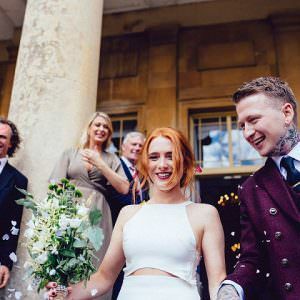 We also didn’t require a car as the ceremony and reception were in the same venue. Emma also created a lot of the decoration herself, and the rosemary for the nametags all came from her step-dad’s garden. 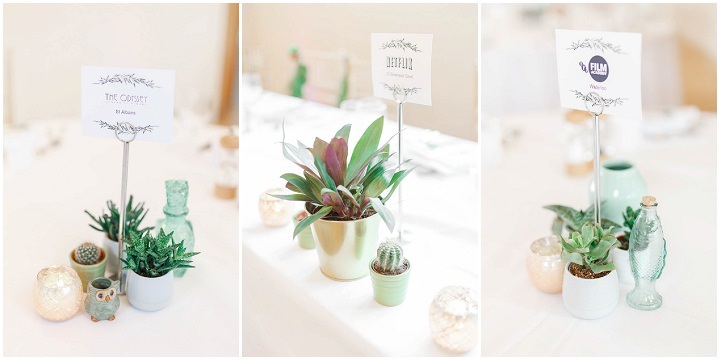 The mini potted plants for the centrepieces, and hanging aloe vera were all bought from Ikea the week of the wedding. The areas that we splurged a bit more on were the photographers, as we knew this was a very important aspect to get right, and we had two bands. 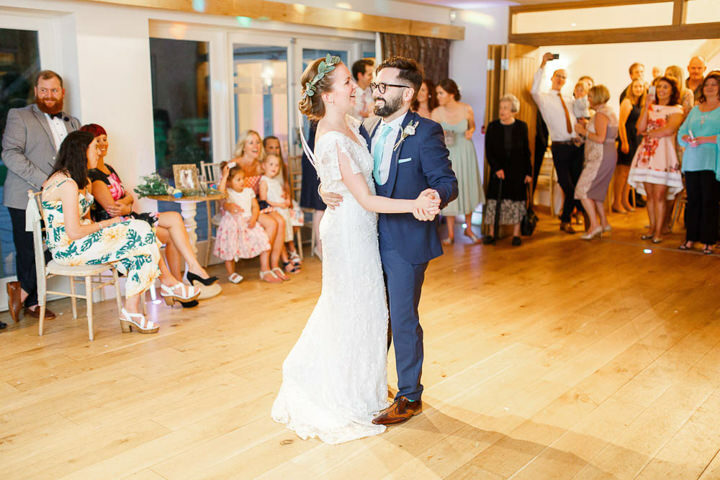 We actually stumbled across by White Stag Photography when Google image-searching our venue, and when we saw how beautiful those particular photos were we decided to find out who had taken them. We had a Skype chat with Catherine and Andy and they were so lovely and easy to talk to, and incredibly relaxed and friendly on the day. 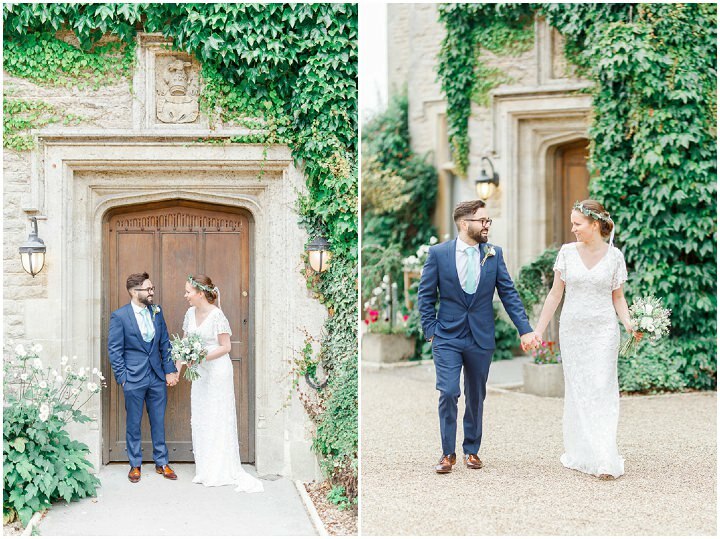 We are so pleased with our beautiful photos and have had compliments from all our friends and family about them. 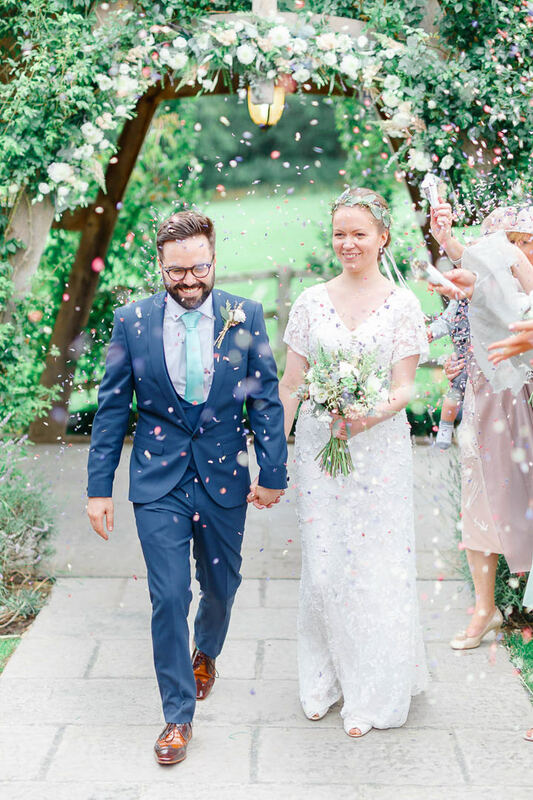 My dress is by Eliza Jane Howell, and shoes by Rachel Simpson. I wore a pearl necklace by Lily & Roo, and pearl drop earrings by Molly & Pearl, both of which João bought for me. 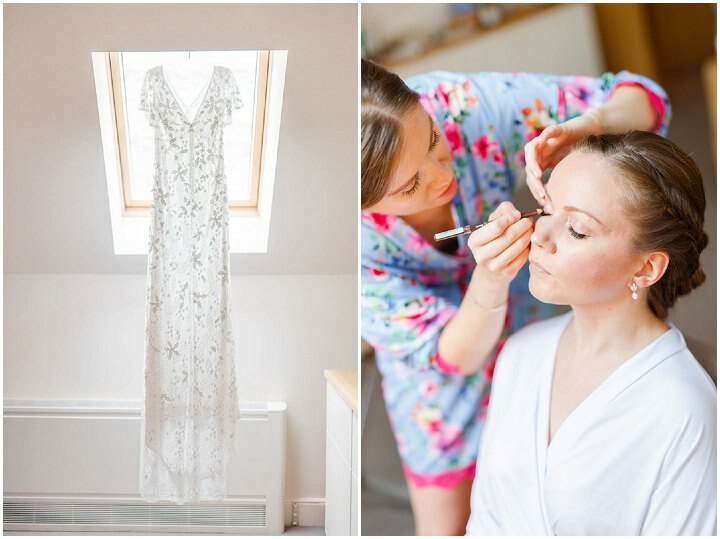 I first tried my dress on in a bridal shop in London and loved it instantly, but wanted to try some more on before I made a decision. 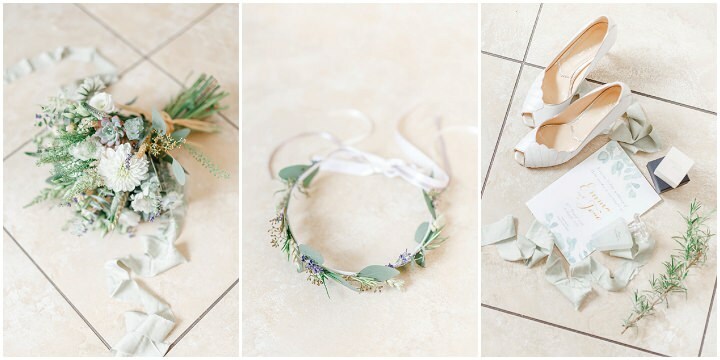 My outfit was finished off with a beautiful green flower crown made with eucalyptus and dried flowers. João’s suit was by Noose and Monkey. He bought it online and then had adjustments made. 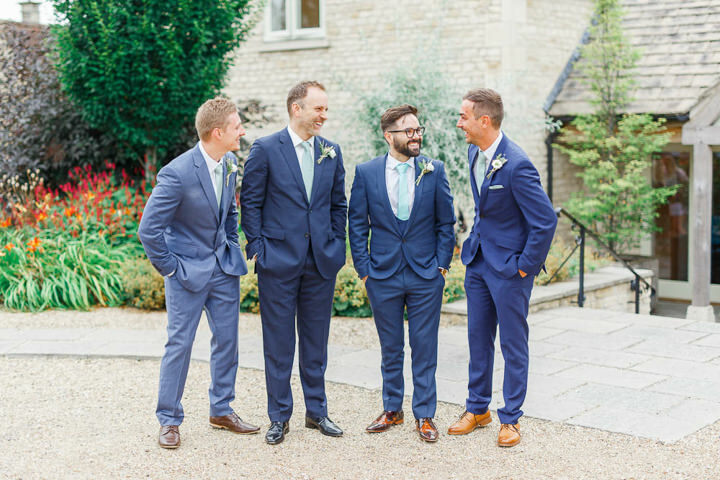 He wore Jeffery West shoes, and a pale green tie to match the bridesmaids dresses. 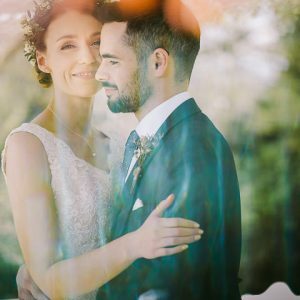 The most special element of João’s look was a vintage Omega watch that his father had bought years ago in order to give to João on his wedding day. 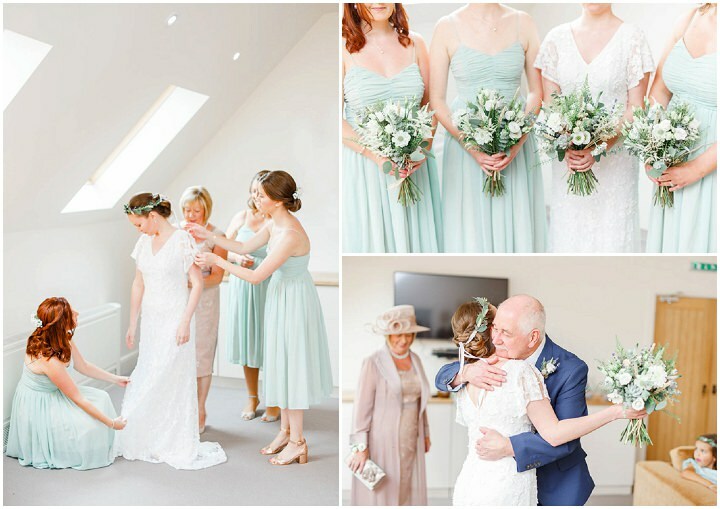 The bridesmaids wore pale green knee-length floaty dresses from ASOS. 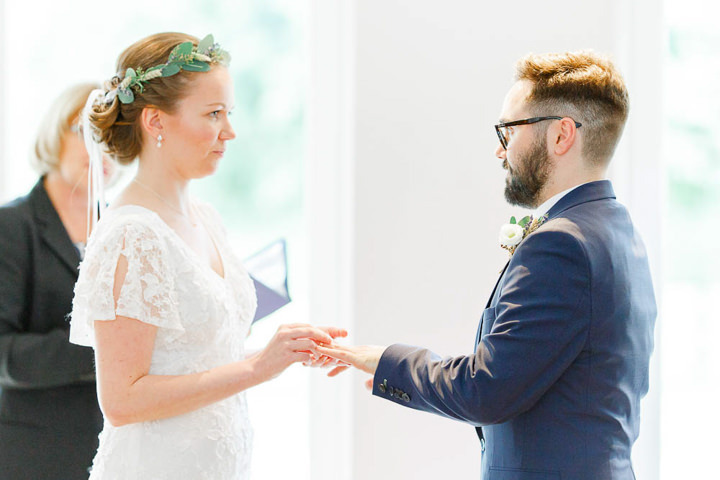 They wore matching Swarovski earrings, which I gave them as their gifts on the morning as we were getting ready. They chose their own shoes, which were all different. 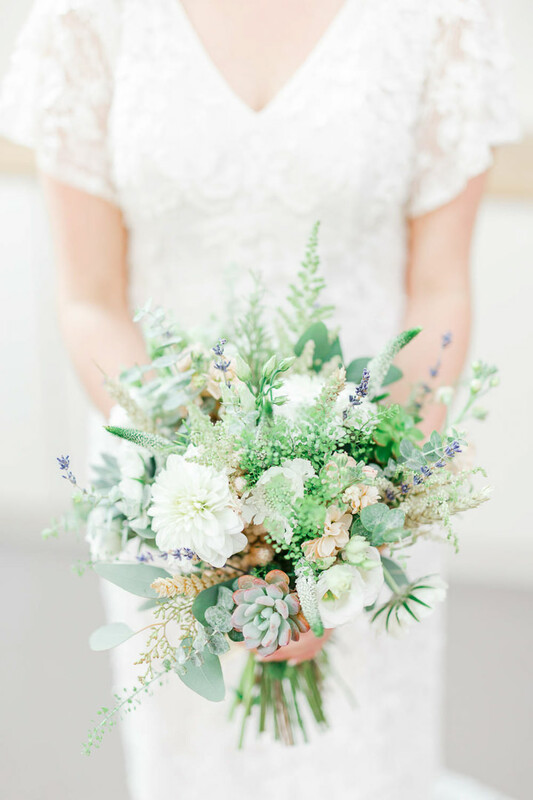 The colour theme for the wedding was green. 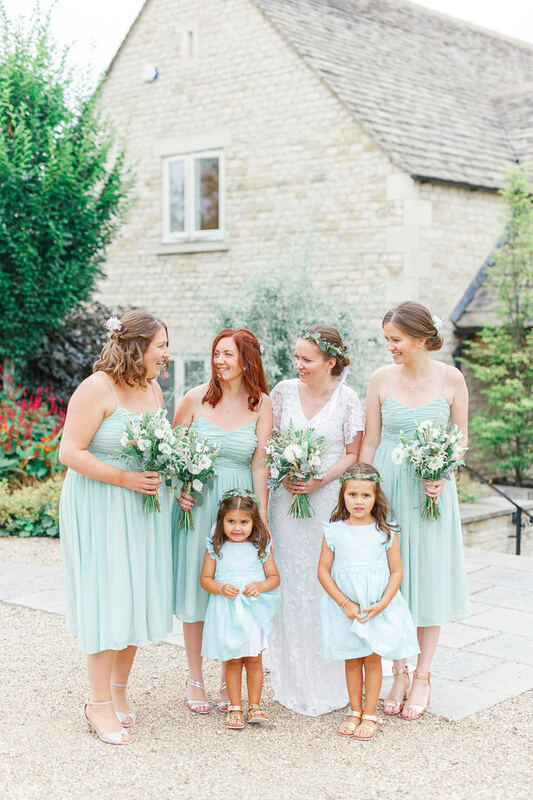 The wedding party used a pale green colour for their outfits and accessories, and this was continued through to other details of the ceremony such as the pale green silk ribbon on the flower girl baskets and back of the bride and groom chairs during the ceremony. 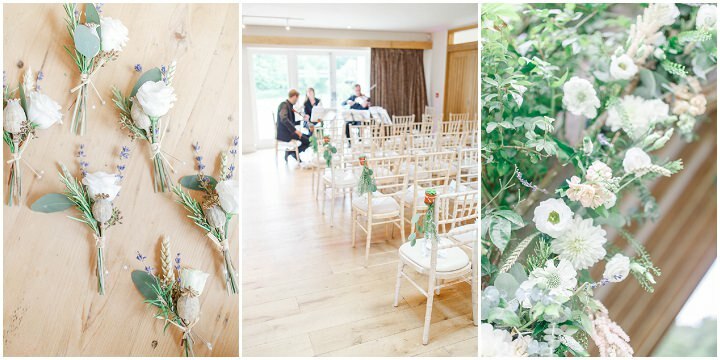 The theme for the ceremony space was green / botanical. 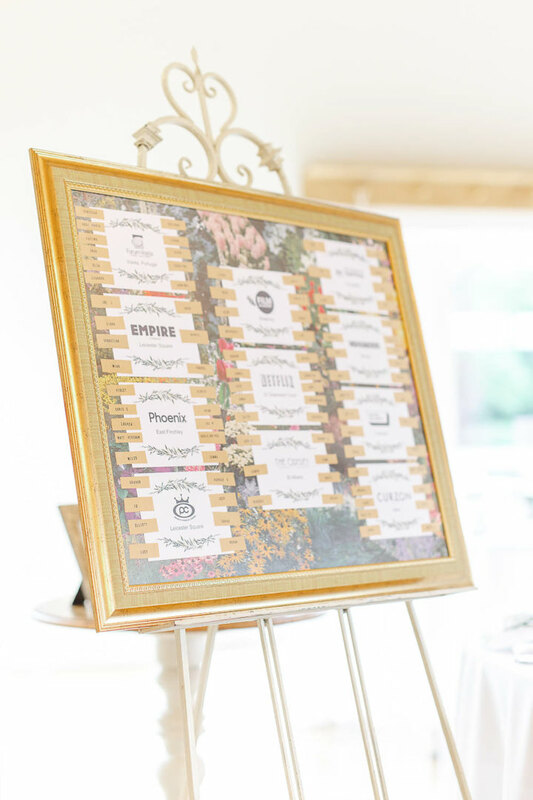 We also had a bit of a movie theme going on the side, as we are both huge film fans; our tables were all named after our favourite cinemas, and the string quartet played movie themes during the drinks reception. 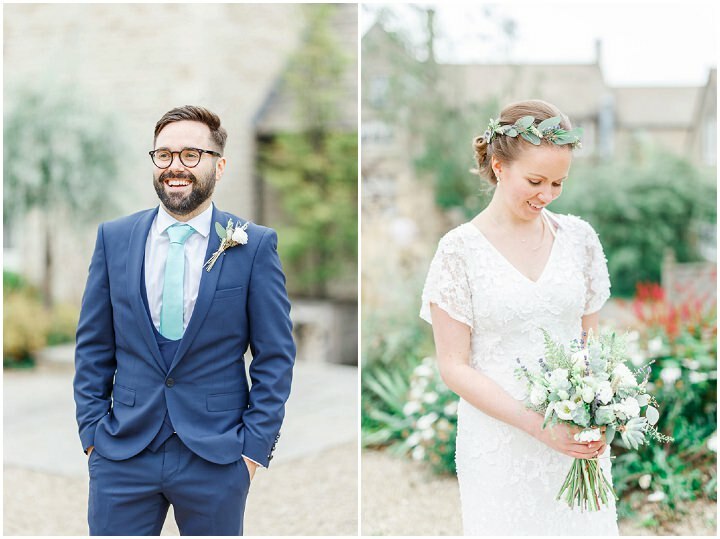 The flowers were created by the wonderful Laura from Cotswold Blooms. 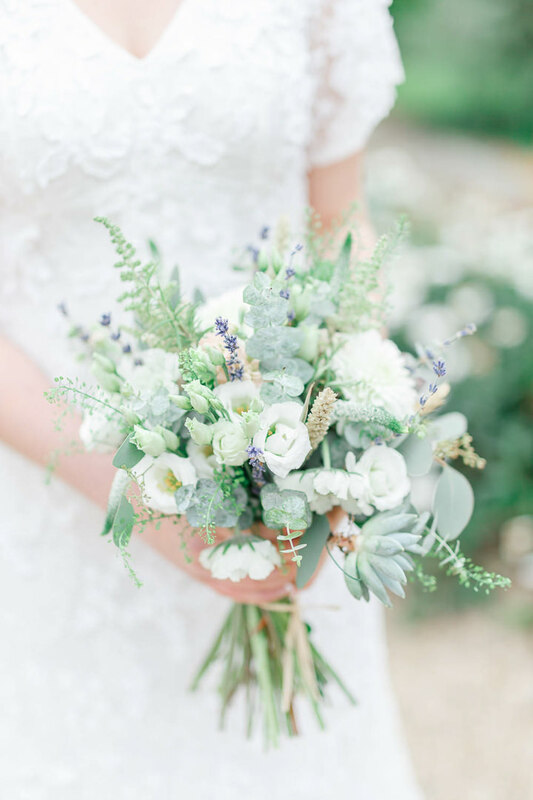 For the bouquets eucalyptus, astilbe and succulents were used to create beautiful greenery, with white dahlia, and then lavender to create a touch of colour. 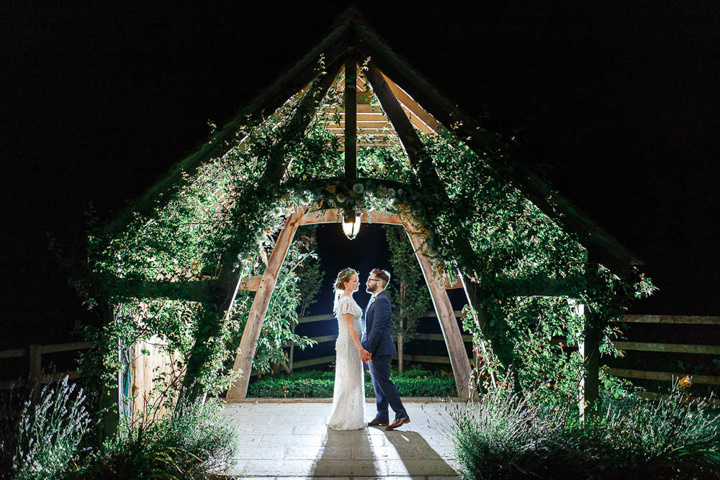 The arbour was decorated with a beautiful display of flowers and greenery matching the bouquets, and mini potted succulents with hanging eucalyptus decorated the aisle chairs during the ceremony. 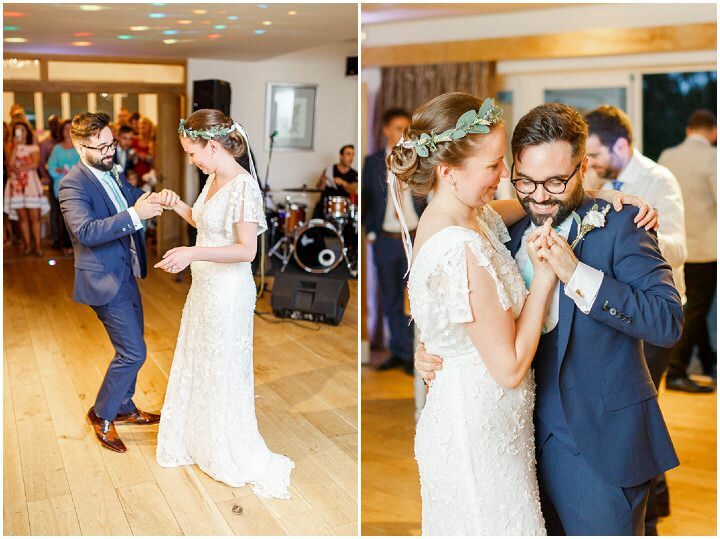 Laura was also responsible for creating the stunning flower crowns worn by the bride and flower girls. 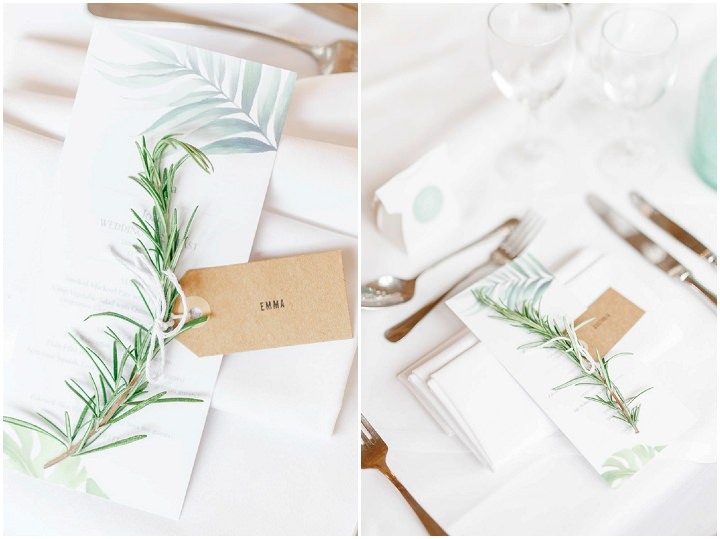 The wedding breakfast room was decorated with a green botanical feel. 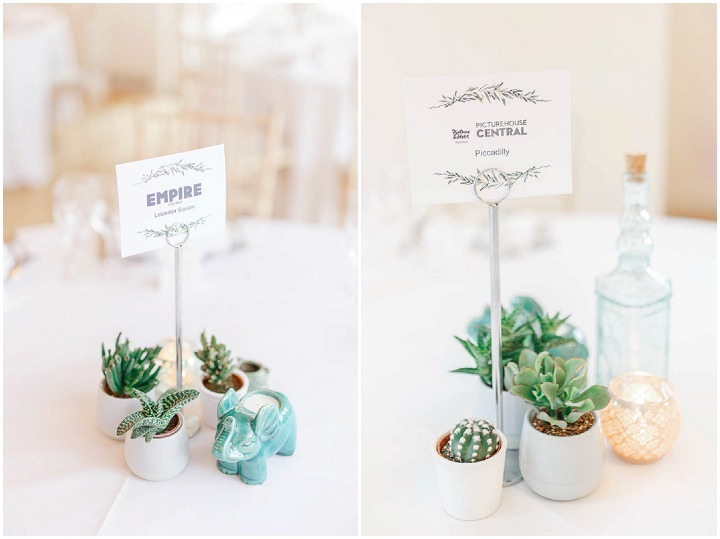 The centre of each table was filled with mini succulents, cacti, and an assortment of green ornaments and tea lights. 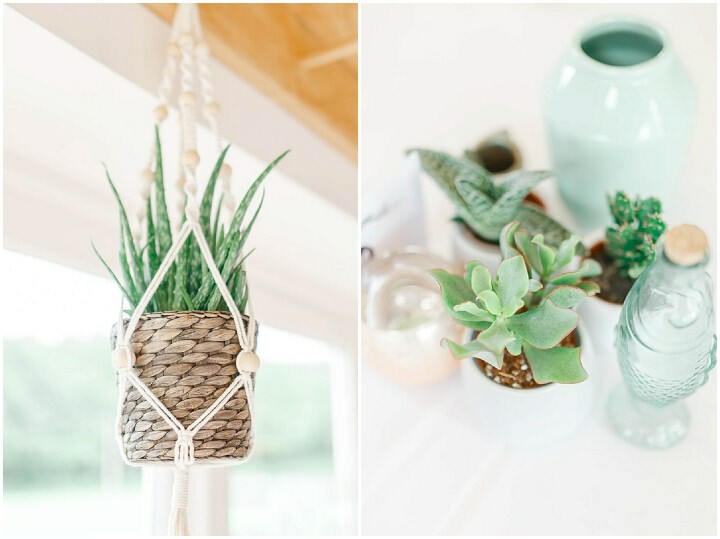 Aloe vera plants in macramé hangers decorated the window. 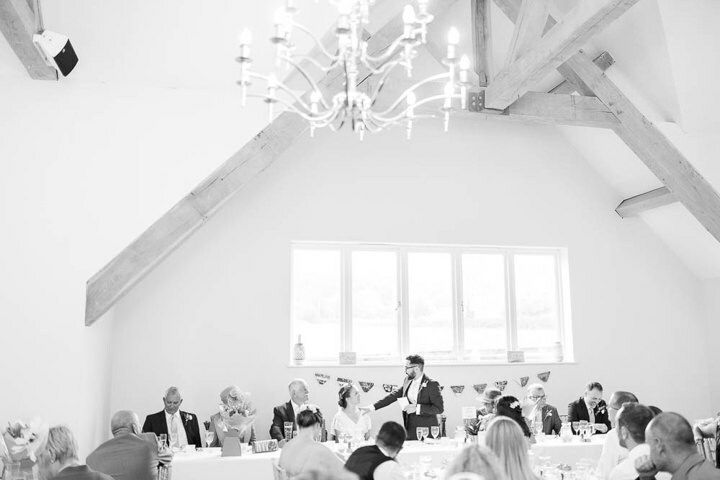 Behind the top table neon signs with the words ‘Amor’ and ‘Love’ sat on the shelf, alongside other decorative accessories and botanical bunting hung underneath. 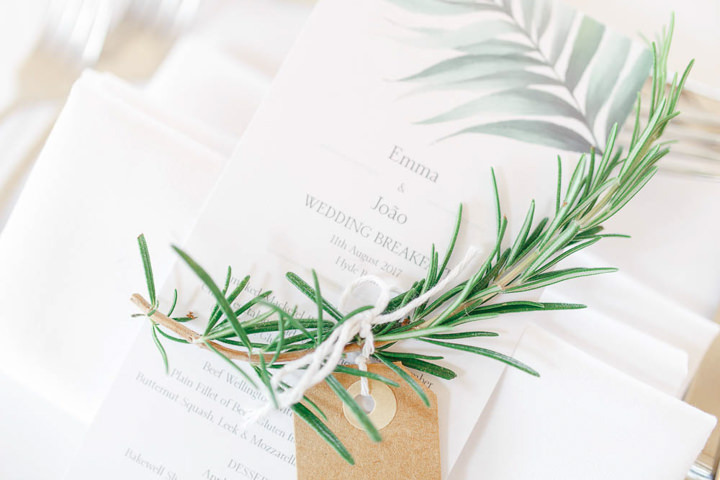 The place settings consisted of a luggage tag for each name tied to a piece of rosemary. 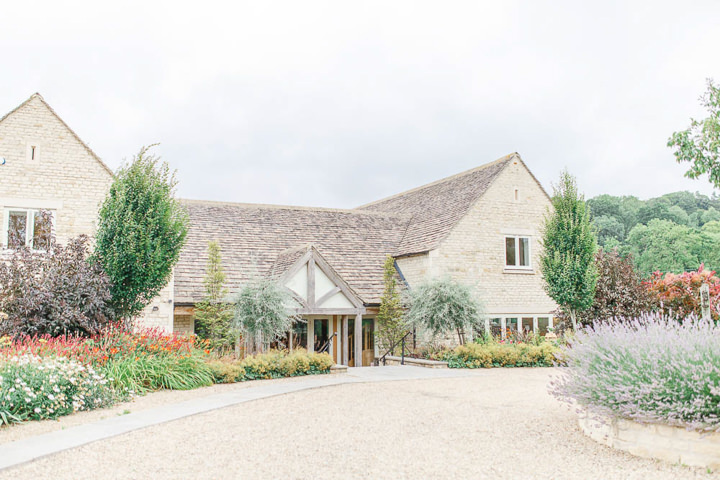 The entrance to the barn was decorated with hanging photos of ourselves and our friends and family, and we used dried rosemary and more ornaments to decorate the guest book table. During the drinks reception we had a selection of four different canapés, served alongside glasses of Prosecco and Pimms. 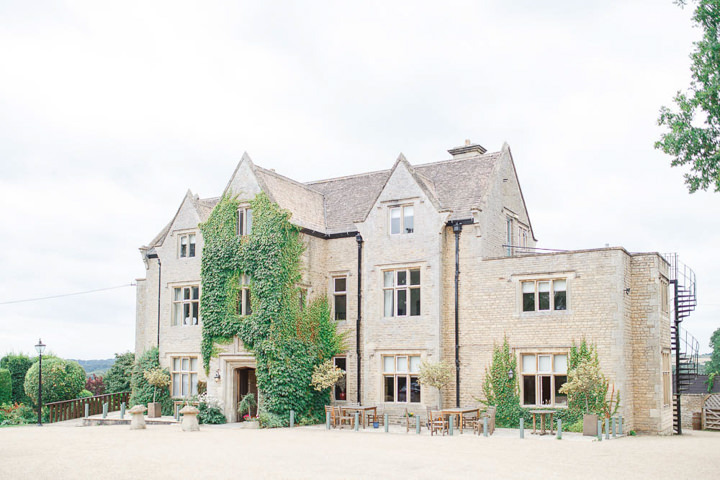 The wedding breakfast menu started with smoked mackerel pate with pickled cucumber, and the main course was an individual beef wellington with dauphinoise potatoes and assorted vegetables. For dessert we had apple tarte tartin with vanilla ice cream. Later in the evening we served a selection of cheeses, Italian meats, mini fish and chips, and salad. 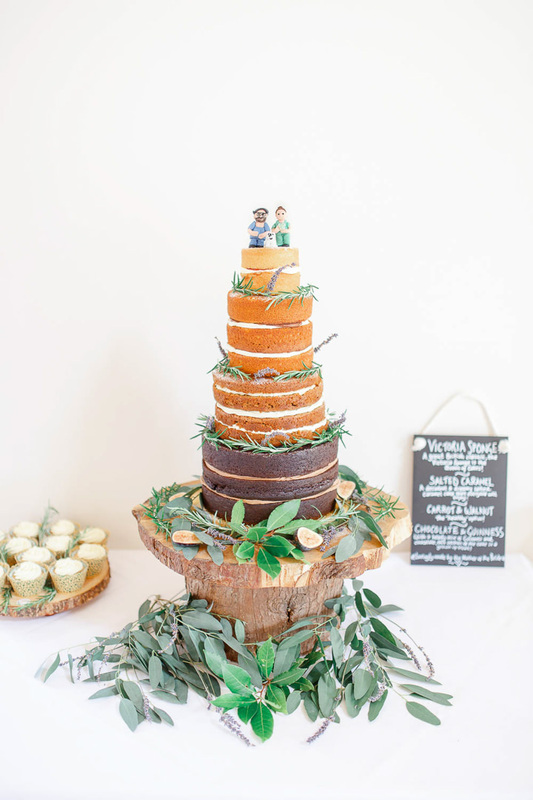 Emma’s mum created the incredible wedding cake, as she runs a small cake business from home. 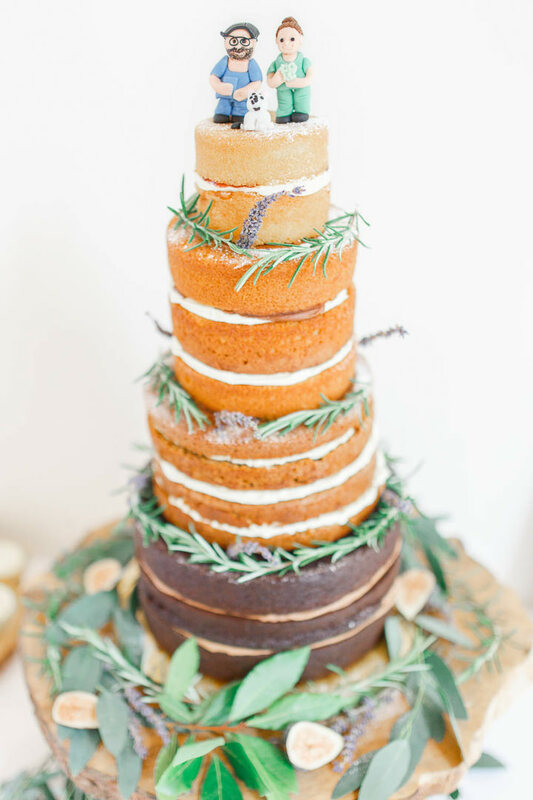 It was a naked cake with four tiers; chocolate and Guinness on bottom, then carrot cake, next was salted caramel and finally a victoria sponge with strawberry jam for the top tier. Herbs and eucalyptus from her parent’s garden decorated the edges, and sat on top were little fondant figurines of us dressed in our nursing scrubs, with our kitten Bobby Patches sat at our feet! 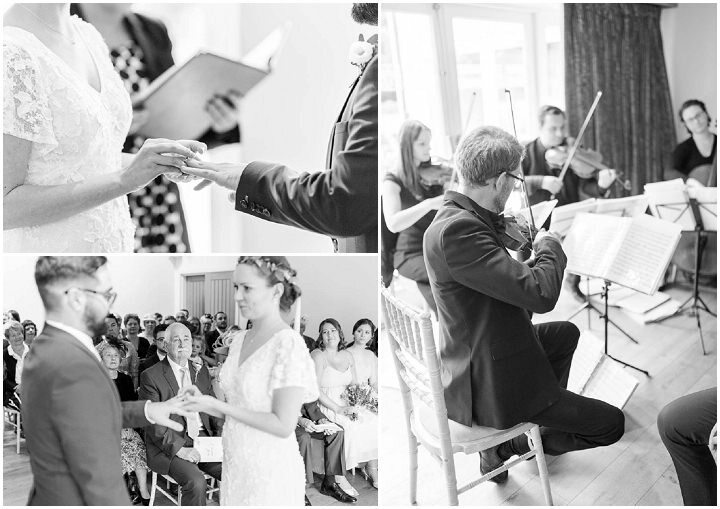 For the ceremony we had Lancashire String Quartet play a selection of classical music as the guests were seated, Emma then walked down the aisle to ‘Kissing You’ by Des’ree, and they both exited to ‘All You Need Is Love’ by The Beatles. During the drinks reception they played a selection of movie themes. There were toys and games to entertain the children in the garden area, and for the evening entertainment Funk The Revolution played soul, funk and motown songs for us to dance away the night to! 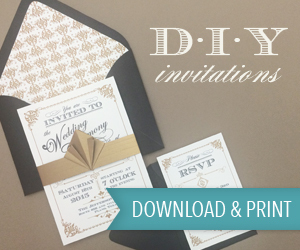 The invitations, save-the-dates and wedding breakfast menus came from Vistaprint. 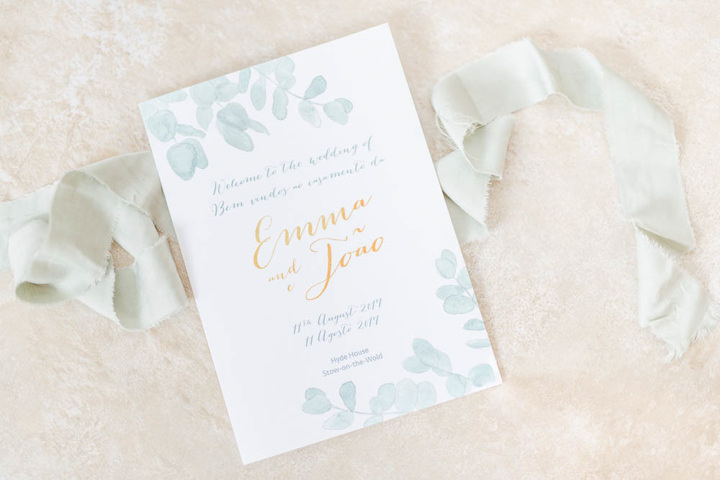 The order of service booklets were from Blush and Gold. 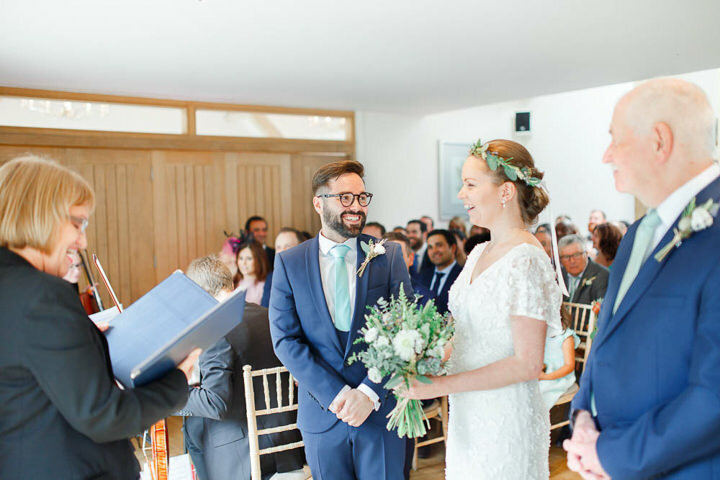 For all of our stationery we created both English and Portuguese versions, and the entire ceremony was translated for the Portuguese guests in the order of service so they could understand what was being said. 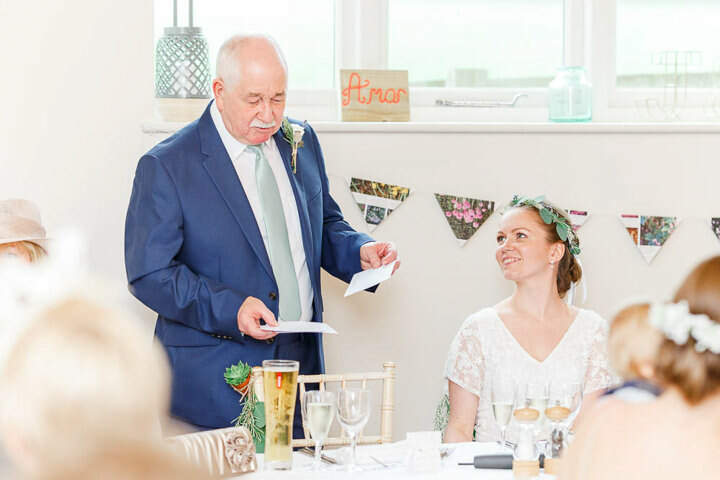 Emma created the botanical bunting and confetti holders herself from pages cut out of a gardening book. 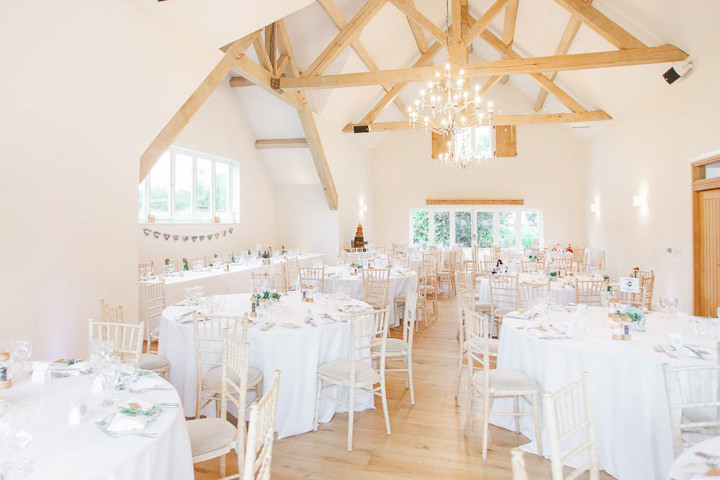 She also meticulously hand-made the seating plan. We bought all the plants for the wedding breakfast room ourselves. 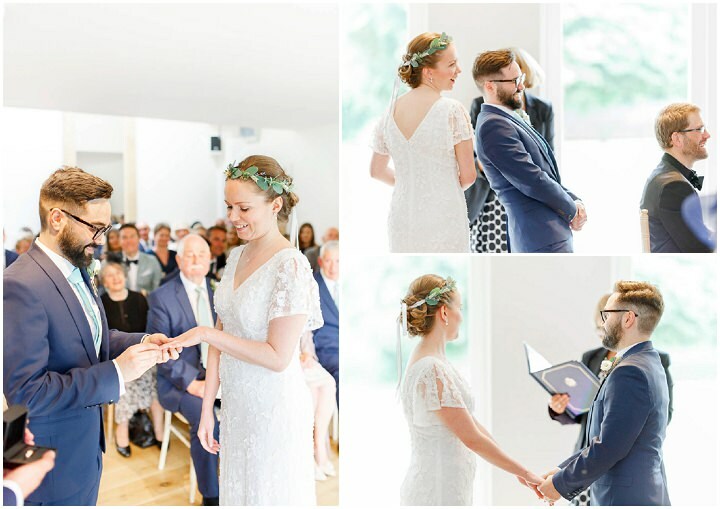 For personal touches we chose readings that were special to us. We were also very upset that our kitten Bobby Patches couldn’t attend so we made sure we had a framed photo of him sat by the confetti! 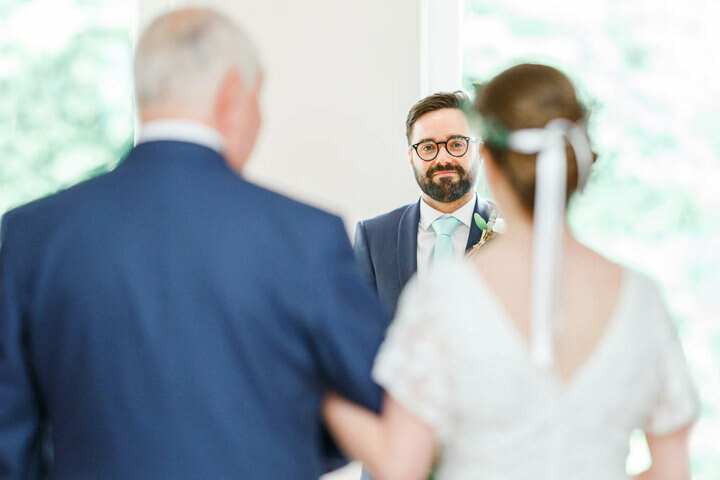 Both Emma and João became a bit emotional during the ceremony (Emma just before she walked down the aisle, and João when he saw her coming). 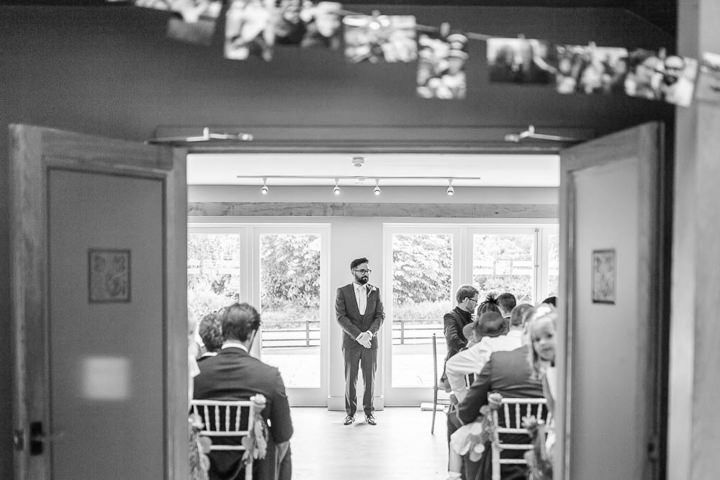 The speeches were all brilliant, and more emotion as João addressed his parents and other family in Portuguese. Another great time of the day was after the party was over, all the guests staying at Hyde House gathered for nightcap drinks in the reception area and tucked into leftover cake. It was so great to for us to see both families getting along so well, even across the language barrier in some cases! 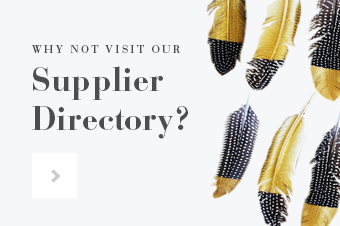 Delegate as much as you can / are happy to. If there are parts of the planning you enjoy, focus on these and ask for help with areas that you are finding stressful. 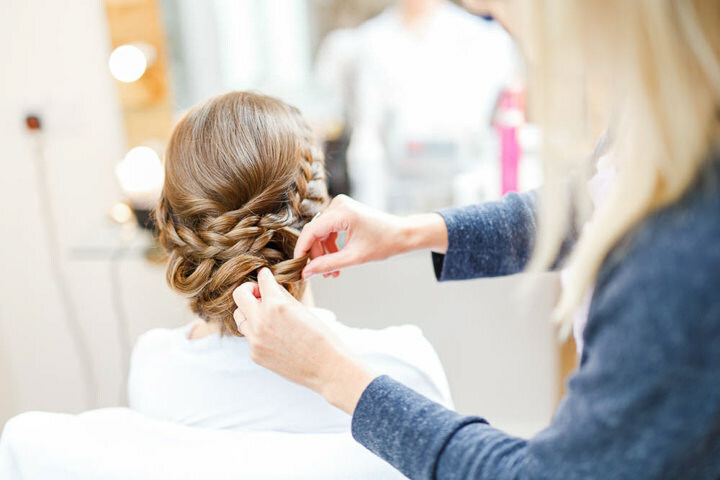 Parents and the wedding party will be happy to lend a hand! The biggest surprise was that we felt so relaxed all day! 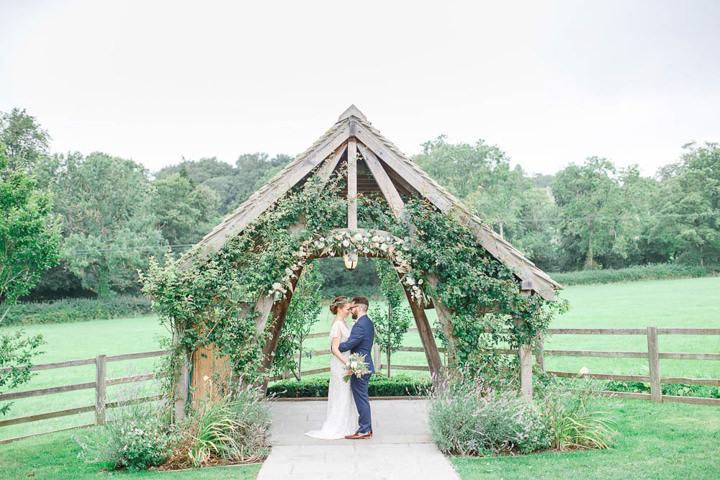 All the stress and hard work that had led up to the day meant that knowing everything was well organised allowed us both to really relax and enjoy the day. We even both slept very well the night before! Wow such lovely images! 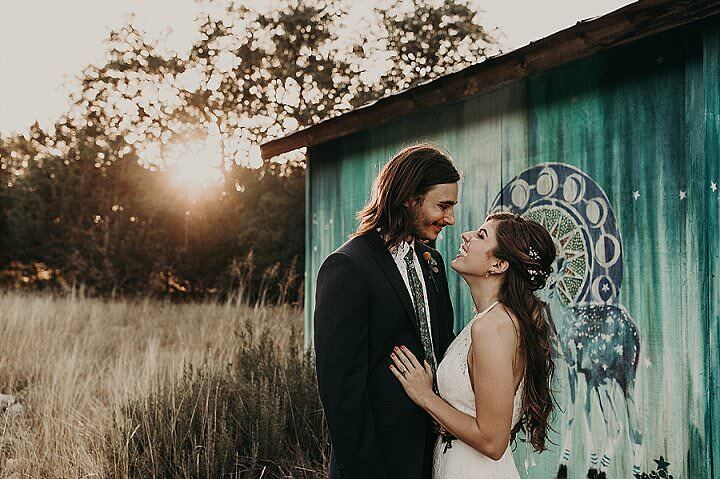 I love the colour palette and all the rustic details, perfect!